Lance’s birthday is November 1. To some people, that’s the day to recover from a rowdy Halloween. To others, it’s All Saints Day. 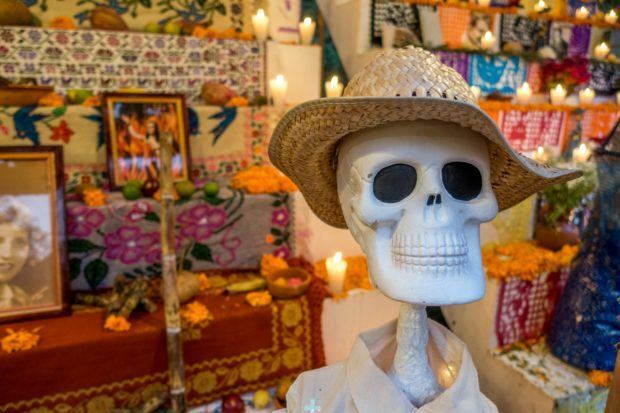 But, to Lance, his birthday is the middle of the three-day Day of the Dead celebration (Dia de los Muertos). 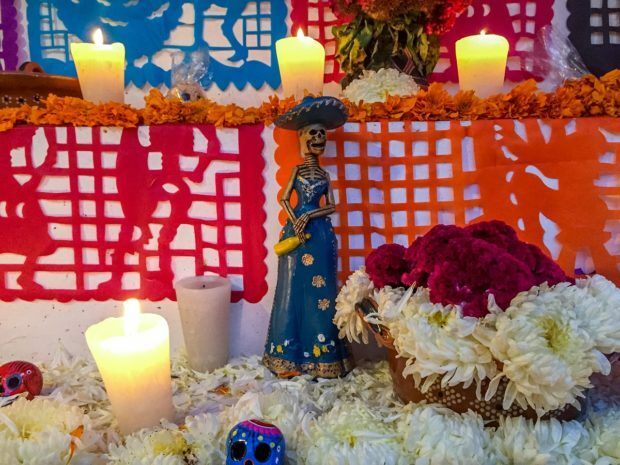 As a result, we’ve always been intrigued by the Day of the Dead customs and wanted to experience them in Mexico. For his 40th birthday, we finally decided to make it happen. 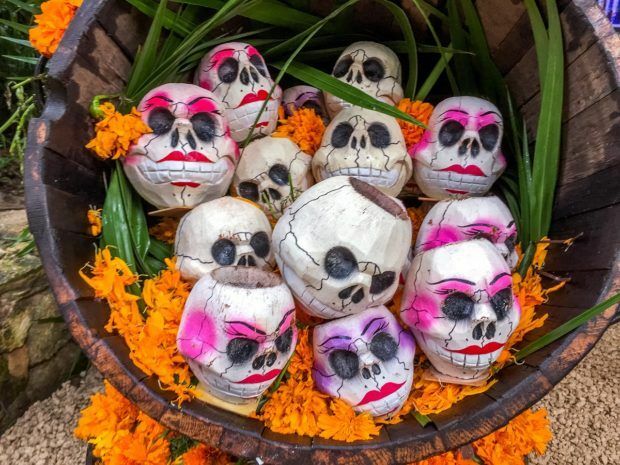 It was a no brainer to head back to Playa del Carmen, Mexico, to Xcaret park for their elaborate Day of the Dead festival. The moment we walked through the gates of the park, the colors, sights, and frenetic energy of the festival came flying at us. 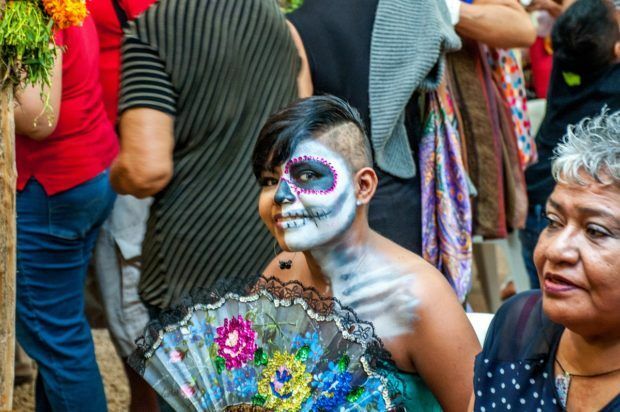 There were people everywhere—some still damp from their adventure through the park’s underground river, some in traditional clothing searching for the face painting station, some making their way to the next cultural performance or looking for the nearest taco stand. We were swept up in it all. We had only walked a few yards before we were mesmerized by the flowers and decorations surrounding us. The deep orange marigolds were strung on garlands down the walls and tied in bouquets to the trees. 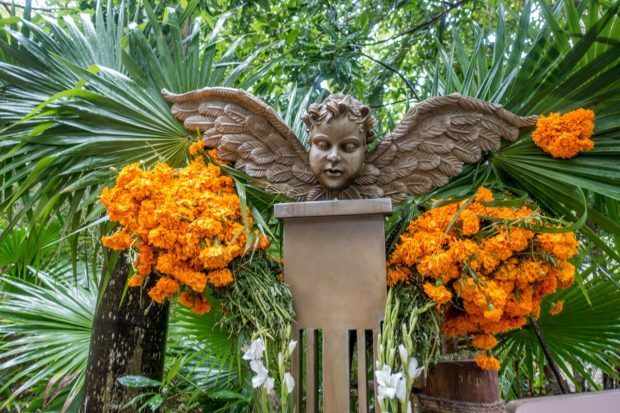 They surrounded statues and were placed at the edges of the walkways, accented by glowing candles, all meant to guide loved ones back to the living. It was clear that we had entered a very different world. Our first stop at the Day of the Dead festival was the local food market. 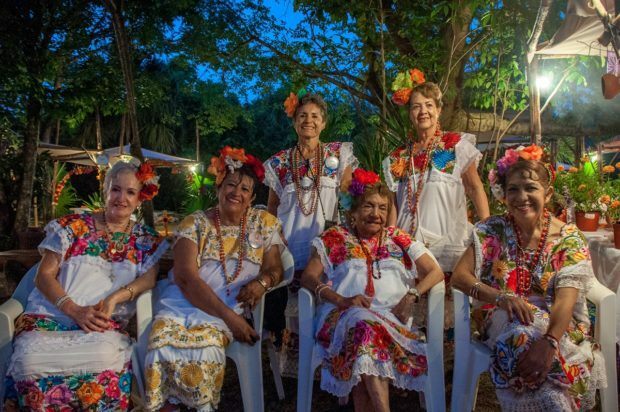 Each year, Xcaret chooses a state in Mexico as the focus of the festival, highlighting their food, their culture, and their Day of the Day customs. 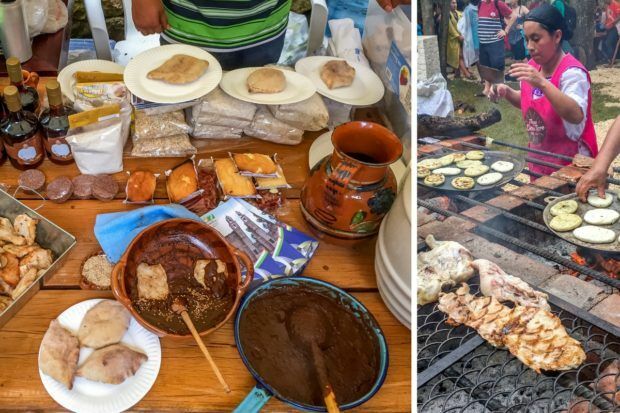 During our visit, we indulged in the food of Puebla, made in traditional ways by people from the state near Mexico City. 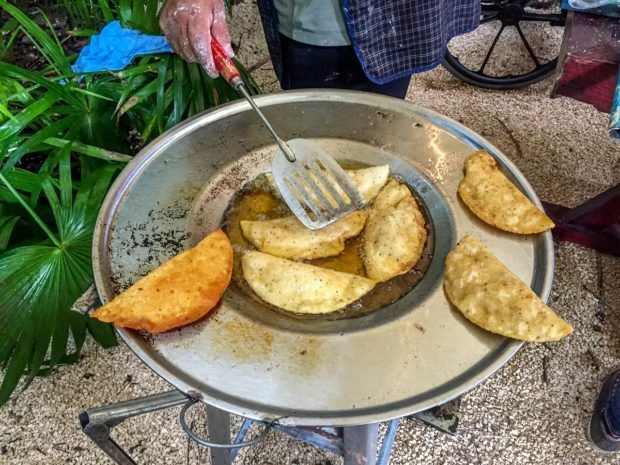 We had cheese-filled masa pies called molotes fried fresh in front of us. We sampled multiple kinds of spicy, chocolaty mole, rich rice pudding, and savory smoked pork straight from the grill. It certainly is not the kind of food you would expect at a theme park, and we loved every minute of it. Our bellies full, it was time to see the shows. There were so many to choose from, but we did our best to fit in a sampling. We watched the Papantla Flyers soar above the park in a special version of their traditional performance put on just for the festival. 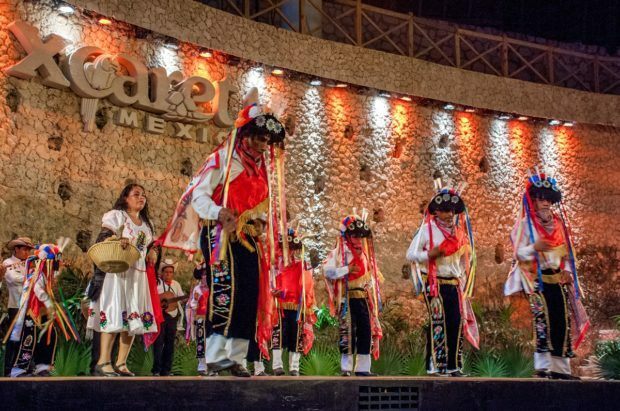 We saw dancers from Puebla celebrating their cultural stories and watched legends come to life on an interactive late-night walk. 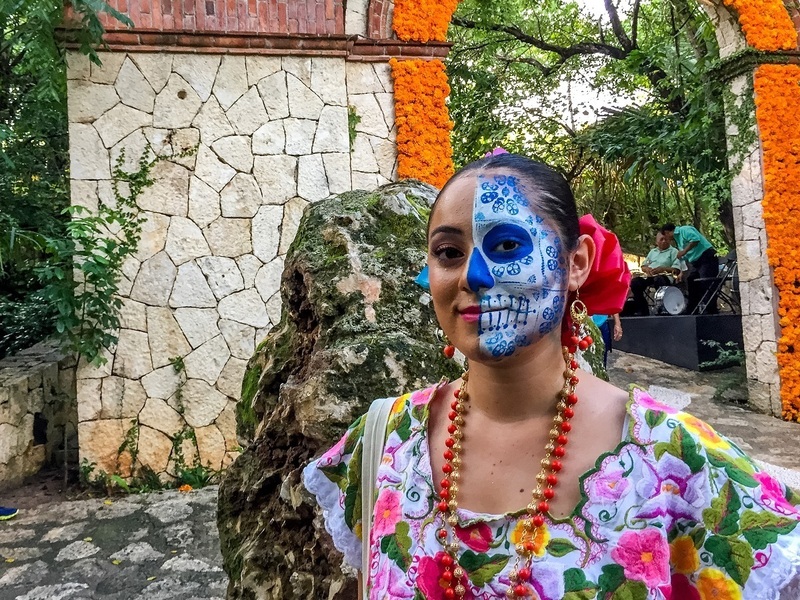 Celebrating the Day of the Dead at Xcaret is so much about taking in the atmosphere. 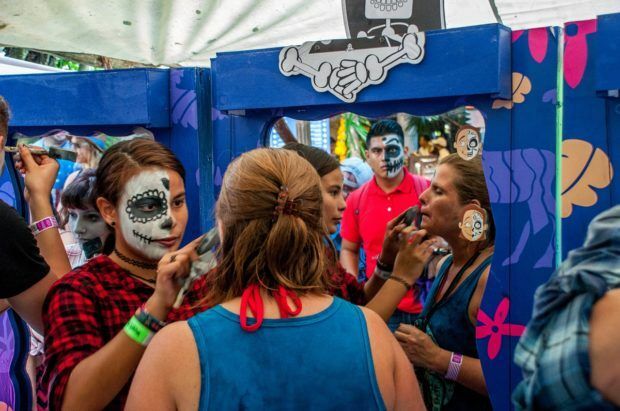 As we walked through the park, one of our favorite things was spotting people—both employees and regular visitors—who had dressed up or painted their faces for the evening. Plenty of people came with elaborate designs on their half-painted faces, representing life and death. Others used the paint at various spots throughout the park, joining in on the festivities. 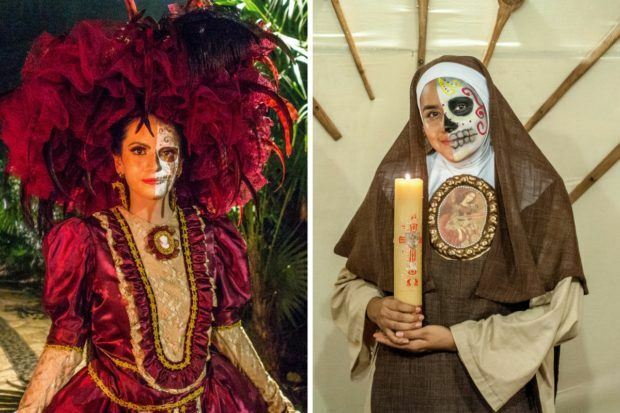 The most glorious were the actors who donned traditional dress and other costumes like the iconic Catrina figure in European-style dress. 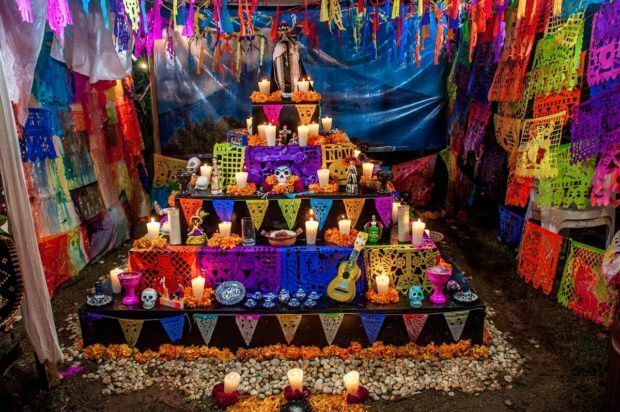 The highlight of our first night of Day of the Dead at Xcaret was our stop at the altars. 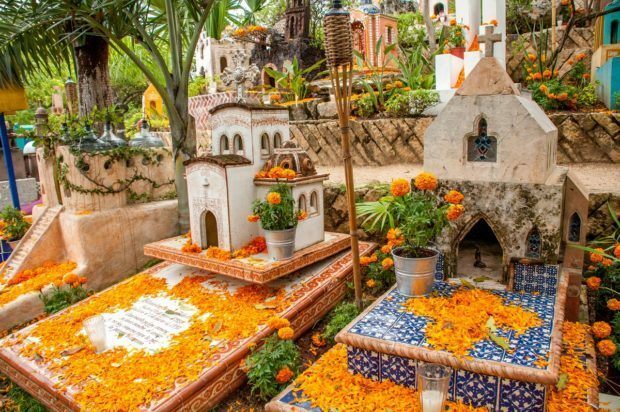 Throughout Mexico, families decorate their loved ones’ graves with marigolds, other flowers, candy skulls, and items that the deceased loved in life like tequila and food. Everything is meant to entice them back into the world and make them comfortable once they get here. The displays can get very intricate, and each is an example of the family’s devotion to the departed. 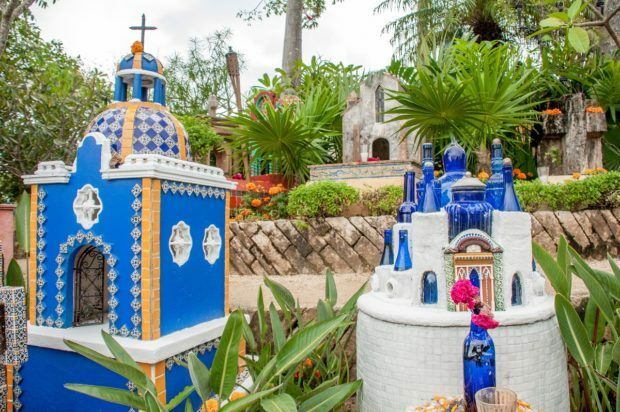 Though the altars at Xcaret are just examples of what’s done in real cemeteries, they are still quite spectacular. 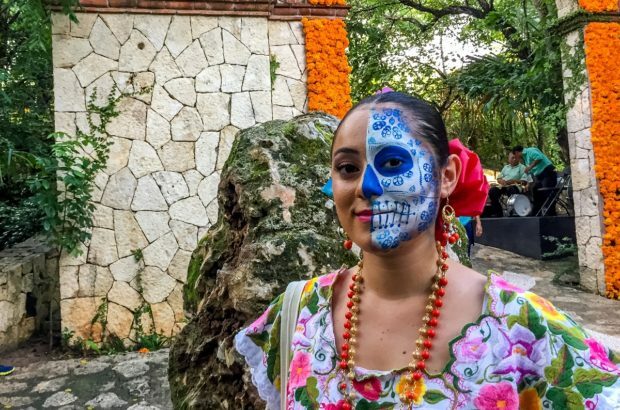 There is so much to see and do at Xcaret’s Day of the Dead festival that we needed a second night just to fit in a fraction of it. Our second day began much like our first day had ended—with a look at the traditions surrounding death and burial. Although that sounds a bit morbid, it’s actually completely the opposite. It’s vibrant, joyful, and fascinating. 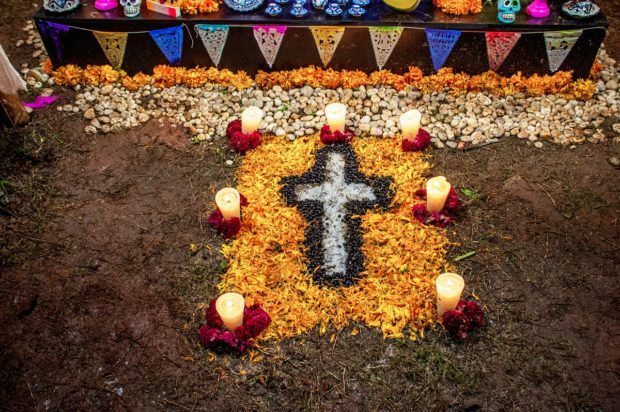 Xcaret features a replica cemetery that’s nearly as colorful as the Day of the Dead altars we saw the previous night. 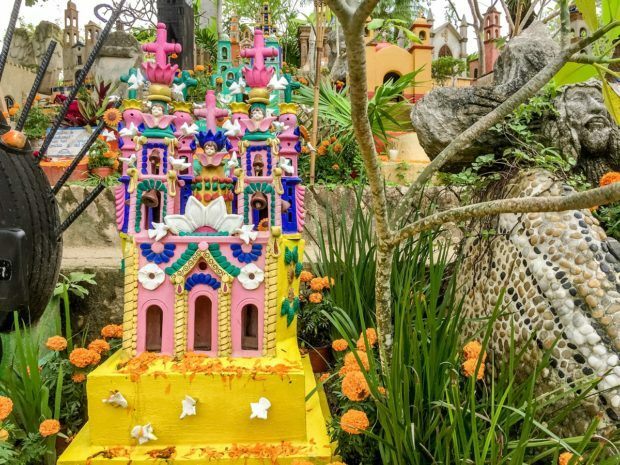 The altars are special exhibits for the Day of the Dead celebration, but the cemetery is a permanent part of Xcaret’s Mayan village and includes representative styles of tombs from throughout the Yucatan Peninsula. Each of the graves that lines the hillside has a unique feature. 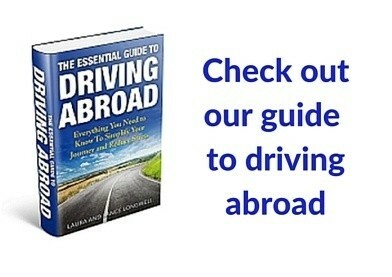 Some include photos or jokes while others include favorite things or memories of the deceased. We spent nearly an hour looking at each mini-art exhibit, intrigued by all the details. Next up: more food. 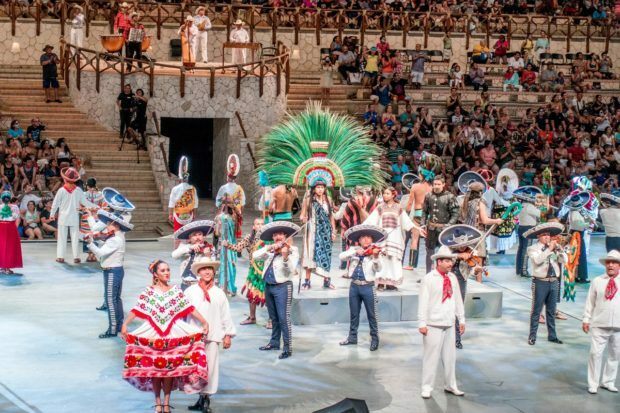 One of the great things about Xcaret is that it’s a brilliant mix of exhibits, rides, performances, and hands-on experiences. 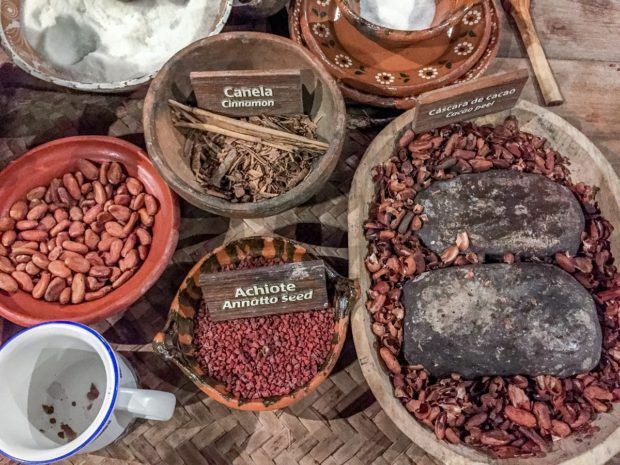 This time, we had the chance to get our hands dirty (only a little) by making our own hot chocolate mix in the fashion of ancient Mayans. As the sweet, rich smell of chocolate hung in the air, we ground away, kneeling to mash our cocoa nibs between the grindstone and the roller pin. Grinding nibs into powder takes a fair amount of force and speed, so we were quite focused, pausing every few minutes to ask our teacher how we were doing. Once we received the desired texture, we added sugar, cinnamon, pepper, and other spices to make the desired flavors. It wasn’t easy, but it turned out delicious. 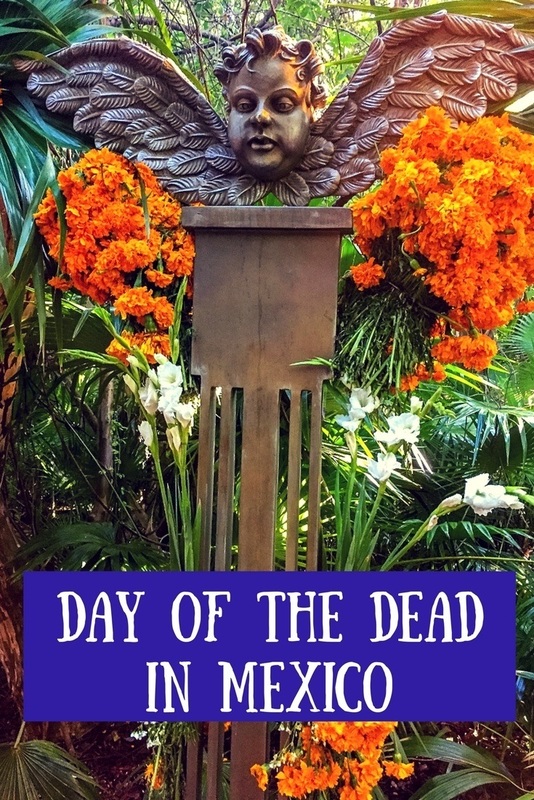 Our Day of the Dead adventure ended the same way that my previous visit to Xcaret had, with the Xcaret Espectacular, a carefully choreographed performance of over 300 actors. The show started with a Mayan ball court on which actors quite literally play with fire. It progressed through the history of Mexico from conquests through the advent of Christianity to modern day. There were dancers in folk costumes, singers dressed as gauchos, and actors with 30-pound headdresses full of feathers. The entire performance, which happens here every night, was enormously impressive and the perfect note on which to close out our visit. Experiencias Xcaret hosted our visit. 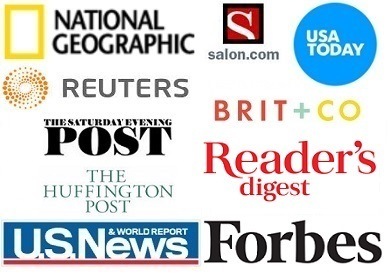 All opinions of the fascinating and colorful are our own.